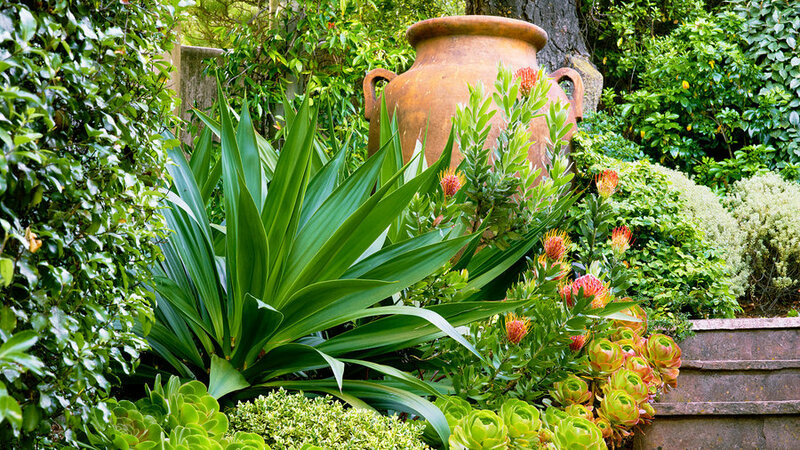 An avid gardener, Tom Hansen was thrilled to see freshly planted greenery in the steep, sunny yard surrounding his new home when he moved from Chicago to Marin County, California, in 1999. After the first full year, though, Hansen noticed that the landscape architect–chosen, one-size-fits-all plantings of Japanese maples, ferns, azaleas, and rhododendrons were struggling despite his constant care. He could keep them alive, but he had to use more water than he thought appropriate for waste-wary California. And the color palette looked out of place on the dry, terraced hillside. 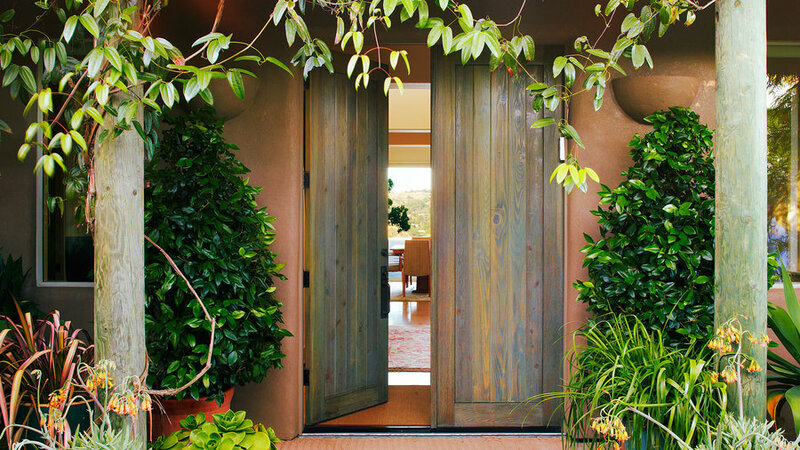 Of course, Hansen had expected a change in the weather when he moved from the Midwest, but he hadn’t fully realized something that gardeners new to the Bay Area soon learn (and that the home’s landscaper had ignored): He was now living in a Mediterranean climate. Aridity replaced the hot, wet summers he was accustomed to. 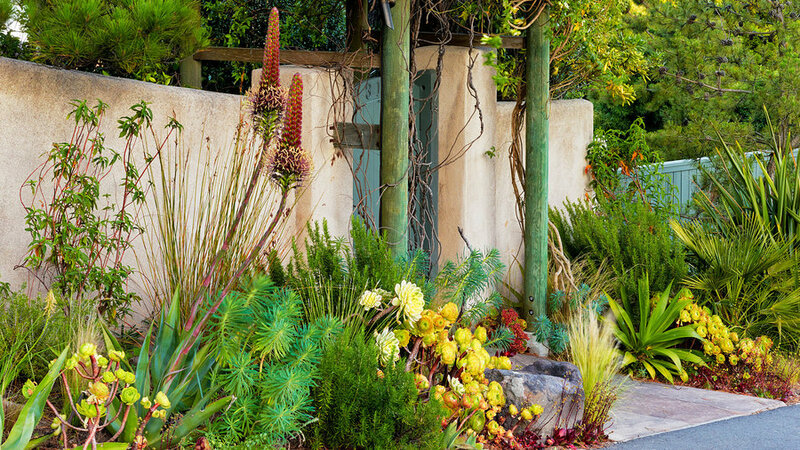 And gardens didn’t just stay awake in winter; California natives and other Mediterranean climate plants, such as South African Leucospermum, came alive. Yes, there was summer fog, a downer to newcomers, but the mist seemed a small price to pay for mild winters and an endless growing season. 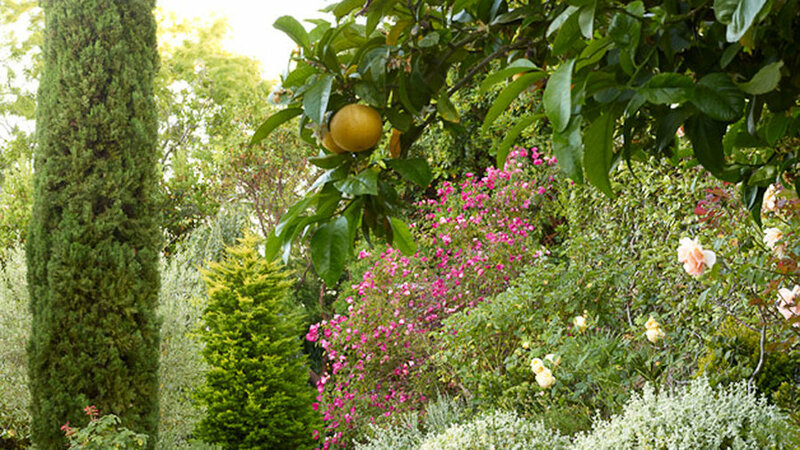 To learn more about what a truly California-friendly garden looked like, Hansen visited local treasures Filoli (), a formal country estate in Woodside, and The Ruth Bancroft Garden (), 3 acres of mostly succulent gardens in Walnut Creek. Over the past decade and a half, he’s swapped out the inappropriate plants for an array of low-water herbs, succulents, and small trees. He exchanged the ferns for lavender and rosemary, the azaleas for aloes, and the rhododendrons for rockrose (Cistus) and pomegranates. Hansen’s third of an acre continues to surprise and inspire him. substance to the passageway. 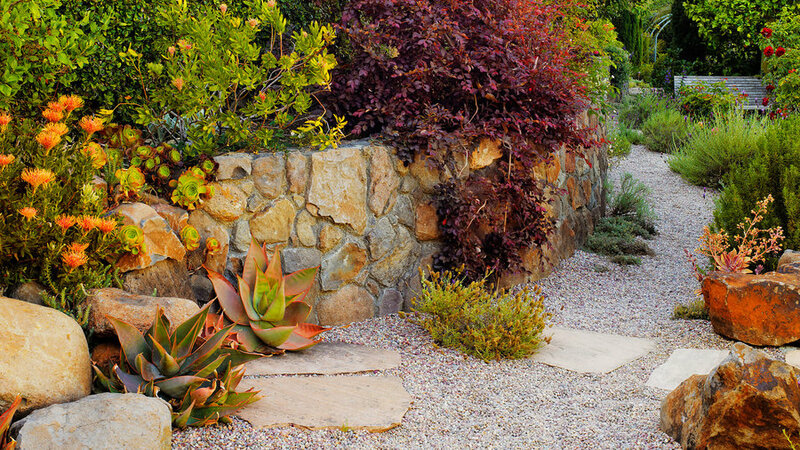 The wall makes the perfect backdrop for Mediterranean plants. 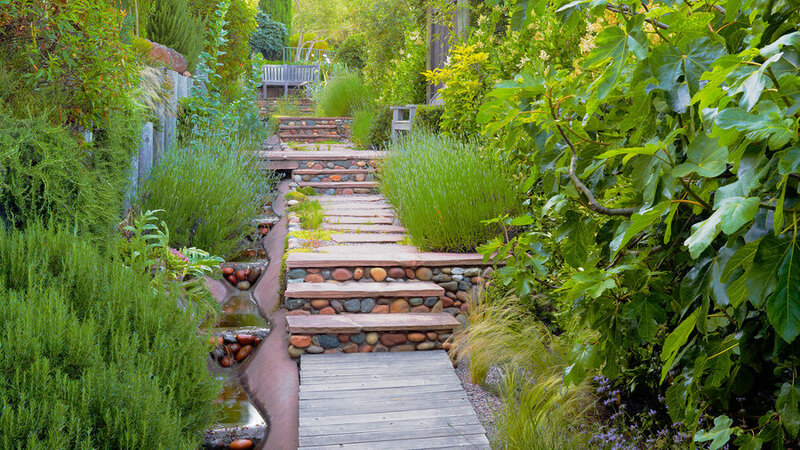 After transforming a storm ditch into a refined water channel, Hansen surrounded it with a playful mix of lavender, artichoke, and Mexican feather grass (Nassella tenuissima). A tank at the top of the slope collects and recirculates water. A bed of green Aeonium, strappy Beschorneria yuccoides, and coast rosemary (Westringia fruticosa) provides a verdant low-water entry garden. The coppery orange hues of the urn and pincushion flowers add vibrant color. 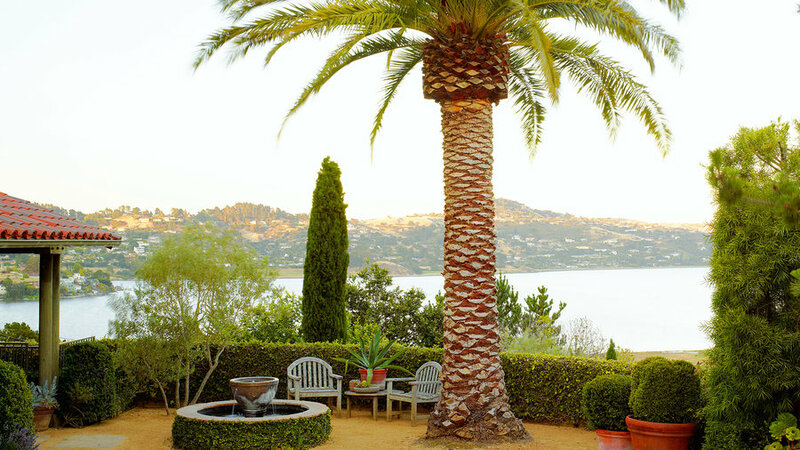 The big statement piece in this outdoor room is a singular Canary Island date palm (Phoenix canariensis) that takes up little ground space but provides a generous canopy. A miniature fig climbs the fountain and the retaining wall that encloses this casual gathering spot near the house. No flower beds needed: Hansen planted large, rich rosettes of coral aloe (Aloe striata) among a tumble of boulders that breaks up a stretch of rock wall. The bright orange pincushion flowers complement the rich burgundy of the fringe flower (Loro­petalum chinense ‘Razzleberri’).